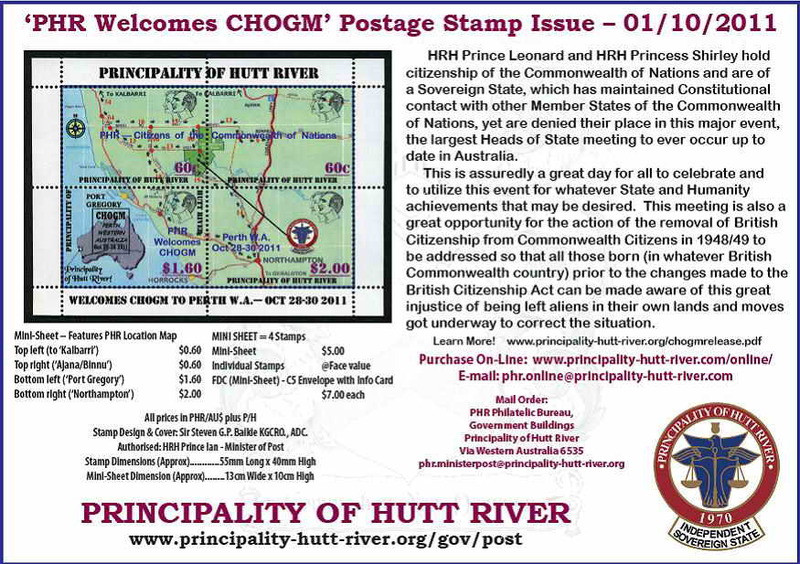 Sovereign of the Principality of Hutt River and all its Territories. Grand Officier du Noble Ordre de Chevalrie et Religieux de la Couronne d'Epines. Grand Collar de l'ordre Souverain Militaire Teutonic et de l'ordre Chevalresque de la Sainte-Croix de Jerusalem. Cabildo de Cavalleros Cubicularios De San Ildefonso. Grand Collar of the Ordem General Abreu e Lima. Founder & Trustee of the Royal College of Advanced Research. Patron & Honorary Commissioner in Chief of the Legion of Frontiersmen, Independent Command, Canada. Patron of the "Royal Enfield Club of Australia Inc."
Another busy time has been had recently and it was very pleasing to have during September three bus tours of tourists from visiting cruise liners to Geraldton and 3 further bus tours in October by passengers from the “Pacific Sun” cruise ship, whist she was berthed in Geraldton. Previous tours from visiting cruise ships to Geraldton in July/August also made for a busy cruise ship visitation for 2011 and we look forward to receiving more in the 2012 season starting July next year. Harvesting of the wheat, lupin and barley crops in the Principality has just commenced, a little later than normal due to the continual cool, rainy weather that has been delaying the harvest, which is expected to be one of the best for many years. The growing season this year has been quite exceptional. I take this opportunity to again remind you that applications for honours are welcome for those people who you deem to have performed “above and beyond” the normal, particularly in relation to others and humanity in general; remember that little consideration is given to performance in an individual’s chosen profession as rewards for those are found by way of income, but rather we look for those outstanding individuals who deserve public recognition for the good that they do for others in particular or society/mankind in general. More may be found contained in the Earl Marshal’s invitation and emailed applications and supporting information are most welcome or if mailing by postal mail, please provide an email address for the nominator on the form so that faster contact may be made should there be any questions to support the application. In the political field of relations with the parliament of Australia, a challenge such as has never before been done, has been placed upon the members of the Parliament of Australia. My staff has had a busy time sending out the challenge to many of the Australian Government’s senior members as well as the Australian Governor General and notification of the same to HM Queen Elizabeth II were also sent, to ensure that H.M. is kept informed as Sovereign of Australia. The recent CHOGM Perth 2011 saw cause for us to issue a CHOGM Commemorative Stamp Issue which is available via our new service of PHR-OnLine and also now via our very new presence on the internet auction site eBay. It should also be noted that The PHR was featured at CHOGM with the doco/movie “How To Start Your Own Country” which features the PHR was chosen to be screened as part of the official CHOGM Film Festival in Perth, Western Australia. As we are about to complete another year, our thanks must again go to all our many honorary representatives around the world who do a great service for us in promoting and supporting our Nation’s needs overseas. This year special mention needs to be made of the progress and initiatives shown by Sir Zeljko Rhia our Hon. Special Envoy to Croatia who we have seen fit to advance to Hon. High Representative to Central Europe and the Balkans, where he will now lead our team of Special Envoys and other representatives in those regions in advancing this nation and its standing further. In closing for 2011; To all people, citizens and non-citizens alike, around the globe who celebrate the fast approaching festive seasons We take this opportunity to wish you all the very best and wish you a safe and enjoyable holiday season. We also take this opportunity to wish you all a very Happy New Year and We look forward to speaking with you all again early in 2012. Our Best Wishes to you all! The Sydney Film Festival organizers invited myself and HRH Princess Shirley to be their guests for the 58th Sydney Film Festival 2011. A documentary movie on micronations titled "How to Start Your Own Country", written/co-produced by Denis Seguin & directed/produced by Jody Shapiro of Everyday Pictures Inc. was being screened at the Festival and the Principality of Hutt River featured as a major part of that film. Acceptance of the invitation was given, and we were accommodated and well looked after by the Hilton Hotel in Sydney during our stay. Great interest was shown in this documentary movie and proved by the sell-out of both screenings. When the National Anthem of the Principality was played everyone in the theatre stood up. The film was very expertly done by Buffalo Gal Pictures/Everyday Pictures Inc. and it might be worthy to note that the Canadian Government were a sponsor to the filming of the documentary. Thanks need to be extended to the Sydney Film Festival organisers for their considerable time spent in organizing the invitation and general helpful attention when we were there in Sydney, particularly to Ms Annabel Grundy, Guest-Coordinator for the Sydney Film Festival, who went out of her way to see that we were well attended and looked after throughout our visit. Our thanks must also go out to all of those who attended the festival as audience to the screenings and who seemed to enjoy what they saw and certainly bought about some good questions to put to me at the Q&A session that followed each of the screenings. Following our return to PHR we have been busy catching up on all that was awaiting us. One of the first visitors to arrive after our return was Mr. Bill Quin (C.W. Quin) who reminded me that when the Secession was declared in 1970, I met him in the W.A. Newspaper Office in Perth , where he was employed at the time as a journalist for the "West Australian" newspaper and that he was the first journalist to write about the Secession. He obtained this visa, and had quite a long talk with myself. I showed him around the various buildings and detailed the various items on display which are of general interest for most people who visit the Principality as well as bought him up to date as to our current position. Life now returns to normal as we continue to greet visitors to our nation and continue with all matters of State that require our attention. The International progress of the Principality of Hutt River has been steadily moving ahead whilst under great political resistance being created by the Australian Government and its departments. Application has now been lodged for admittance into the Union of the British Commonwealth of Nations, who will be holding CHOGM (Commonwealth Heads of Government Meeting) in October 2011 in Perth, Western Australia. In the field of Research on the Energy of Creation and the Energy of Spiritual, a Study CDROM has now been published, with a compilation of the major writings done by myself, over a period of some 39 years, in trying to find the Pure Physics and proofing of such fields. This CD begins with research to understand the major religions, and the usage of mathematics in relation thereto, wherein the mathematics become a virtual language. Probing and reaching in the various factors and finding proofing through verification within the Fibonacci Series, then having identified the Nature’s Constants for the Energy of Creation and the Energy of Spiritual, this then identifies their mathematical codes and binding unity. Reaching further for the originating source of the Life Force, and the identity of the Singular Energy Code which forms all other energy structures. The prime originating purpose included identifying “God”, the scientific truth of what constitutes that known as “God” has been done within this research. Membership of the Royal College of Advanced Research is now also welcomed, the fee for which is PHR/AU$50.00 per year. A photo ID showing status of MEMBER of the RCAR will be issued and a copy of the Study CD will be presented to each MEMBER of the Royal College of Advanced Research. The contents of this CDROM undoubtedly are one of the most advanced projects to have ever, in man’s history, been achieved in the field of the 'Pure Physics of Creation'. Truth is often not desired by mankind. Some governments are being advised on some factors related to that which this research shows, factors that have great international applications which in time will greatly contribute to the peaceful co-existence of nations and their people. No other research has the ability to achieve that which this research offers mankind. It is very pleasing to note the continued excellence of our sporting clubs/teams/individuals, the Royal Hutt River Silvertails in Western Australia, Hutt River Dedication Cricket Club in South Australia, the Royal Hutt River Rally Team with member drivers/navigators around Australia who we look forward to hearing more exploits from during this year and of course our individual Novelty Sports representative Dame Julia Galvin DSOL, who visited us again in January this year, continues to represent us well. The commencement of the Royal Hutt River Golf Club Inc. is another social sporting progress, commenced in 2011 and seeking members from around the world NOW! We look forward to more sporting individuals and teams joining with us this coming year. We are also most pleased with the efforts of the Legion of Frontiersmen Independent Command Canada, of which I am the Hon Commissioner in Chief, they have been achieving great things for their local community and continue to grow in both numbers, strength and service. I must again make mention of the Royal Enfield Motorcycle Club Inc. of Australia of which I am honorary Patron. It is nice to be associated with such a group of individuals and persons with such a love for their machines and their history. Of our RHRDF units and members around the globe I must say thankyou for services given and provided over the years and this year We hope to commence to enliven and expand our Defence Force Membership, bringing in new members and new life and hopefully seeking out some new aims and objectives to meet, things to bring our members more into the public eye to shine even brighter for PHR. Lastly We must again thank our great group of Representatives around the globe, many achieving great things for PHR. This year We hope to streamline our Representative positions further and we will continue to elevate our senior Representatives to Principality e-mail addresses and list them on the Government contact list as we continue to improve the security in this area. You may find more details of the achievements of all of the above on this website. Whilst 2010 was a pleasant, progressive year, 2011 may be even more pleasing.